Richard Karl Freiherr von Weizsäcker (German: [ˈʁɪçaʁt fɔn ˈvaɪt͡szɛkɐ] ( listen); 15 April 1920 – 31 January 2015) was a German politician (CDU), who served as President of the Federal Republic of Germany from 1984 to 1994. Born into the aristocratic Weizsäcker family, he took his first public offices in the Evangelical Church in Germany. A member of the CDU since 1954, he was elected as member of parliament in 1969. He continued to hold a mandate as member of the Bundestag until he became Governing Mayor of West Berlin, following the 1981 state elections. In 1984, Richard von Weizsäcker was elected as President of the Federal Republic of Germany and in 1989 he was re-elected for a second term. As yet, he is, together with Theodor Heuss, one of only two Presidents of the Federal Republic of Germany, who have served two complete five-year-terms. 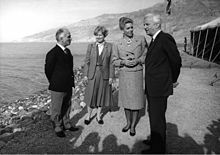 During his second term as President on 3 October 1990 (German reunification), which made von Weizsäcker the first democratically elected head of state of Germany as a whole since President Paul von Hindenburg had died in office on 2 August 1934. We must not regard the end of the war as the cause of flight, expulsion and deprivation of freedom. The cause goes back to the start of the tyranny that brought about war. We must not separate 8 May 1945 from 30 January 1933. Von Weizsäcker's words in front of the Reichstag on 3 October 1990, which were drowned in the noise of the celebrating crowd. It was specifically Berlin's Turks from whom I won my view that the German citizenship law was in urgent need for reform. [...] The longer it lasted, the more the jus sanguinis lost its sense compared to a jus soli. Should it really be made difficult for children of foreigners in the third generation to become Germans, even though it would not be a return, but emigration for them to go to the country of their ancestors [...]? What's the good word on Richard von Weizsäcker?